Between the San Fermines (Running of the Bulls), La Tomatina, Fallas, Semana Santa, Aste Nagusia, San Isidro, the Feria de abril, the Goose Torture festival of Leikeitio and the Saint Day of anyone and everyone who has ever become a saint in the history of the world, Spain has a long-standing tradition of festivals. Although I despise large groups of people when they are sober, let alone drunk, during my six years in Spain I have had the opportunity to attend a few of these festivals. Every village, town and city in Spain has a patron saint, and they have a festival to celebrate said saint. 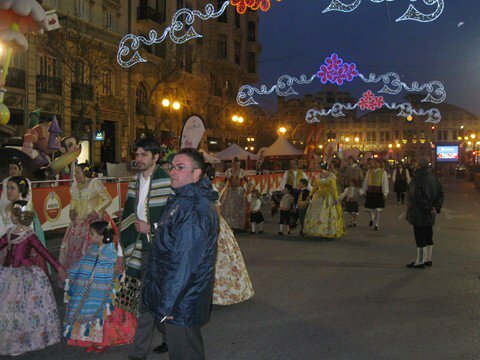 My first touch of Spanish festivity was during my three months study abroad in Toledo. Like the naïve guiris we were, my study abroad group took taxis to a nearby village to see a bullfight during the festival of the town. I don’t remember the name of the village, as my knowledge about how the Spanish autonomous communities and provinces worked at the time was nil, but I do remember being attracted to the bullfighter (torero, not matador, as that means killer. Granted, most modern Iberians see toreros as matadores, but I digress.) I remember being worried that the beef we were eating next day came from the bull that we had seen slaughtered the day before. Most Spanish festivials do have bullfights, although most of the Spanish avoid them. Fast forward to 2011 and my first touch of a famous Spanish festival. I was living in Valencia and experienced firsthand the chaotic madness that is Les Falles (Las Fallas in Spanish). For those of you who don’t know what the Falles are (I’ll use the Valencian spelling), they are a cleansing of the winter just in time for the spring. To properly cleanse from the winter, one must build a giant, elaborate paper-maché sculpture and burn it down four days later. Over the years, they became to be connected with Spanish Father’s Day (San José) on March 19th, right around the first day of spring. During the years of Franco, everything had to be related to Catholicism, so suddenly the festival added two days of marching folks in traditional Valencian costumes taking a rose to the Virgin Mary in Plaza de la Virgen and placing a flower, one by one. Add in fireworks and some agua de Valencia and you’ve got yourself a huge festival. The festival kicks off with a mascletà at the end of February. A mascletà, for the uninitiated, is a bunch of fireworks going off in the middle of the day creating a bunch of smoke that makes one feel as if they are in the middle of Baghdad during a bomb. These mascletàs happen daily in the month of March, becoming more and more elaborate as the month marches on to La Crema (Valencian for The Burning). The festival official gets underway in the evening with fireworks and the presentation of the Falleras, or La Crida. The mayor (currently Rita Barberà) attempts to speak valenciano. People line up at the Torres de Serranos to see this event. A few of the streets in the Russafa neighbourhood of Valencia have a competition to see which street can decorate itself better with lights, Els Carrers de Llum (the Streets of Light). They turn on the dancing lights to classical music every night starting in early March. At the same time, the city starts erecting the Falles Monuments around the city. Every important plaza and every neighbourhood has at least one, and they are in a competition with each other to build the best. They spend the entire year creating them. On March 15th, they are finally revealed to the public in all their glory. The nightly fireworks begin the same night, and the biggest and best celebration is the Nit de Foc (careful pronouncing Night of Fire in valenciano, folks!) on the 18th. Bunyols, a fried squash treat, are eaten all over town as people oooo and ahhhhh over the monuments satirizing the Spanish and Valencian governments and culture. My fave Falla will always be La Bella y la Bestia with Rita Barberà as the Beast and La Bella is ex-Valencian president Francisco Camps as the Beauty with all his new suits. I also enjoyed BarackNieves (a pun of Snow White in Spanish) and the Seven Thieves of South America. Then there was the monument for Las Princesas, which compared La Princesa del Reino (now Queen Letizia) with La Princesa del Barrio, Spain’s very own Kim Karshardian BELEN ESTEBAN! And then on the 19th everything is set on fire and Valencia is cleansed of their yearly sins. The morning of the 20th, it’s like nothing happened. By the time the city wakes up, hungover and super tired, the city is back to normal, or what constitutes as normal in Valencia. A continuación…Pilares, Semana Blanca (Vitoria) Aste Nagusia, Orgullo and the poor geese of Leikeitio. ← Not a Happy Camper. Summer Camps.